TianjinPortTours.com is an E-tourism brand operated by Beijing Explore Tours CO., LTD.
A guide and a driver are quite necessary in your tour trip. A professional guide and experienced driver are a must. 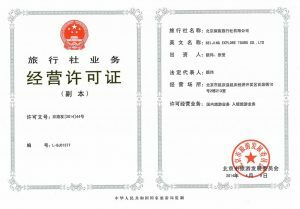 All guides provided by TianjinPortTours.com are qualified professionals and registered English Speaking Tourist Guides in China relative travel administrative department, who are reassessed annually. Not only can they guide you around every attraction but also lead you deeper into Chinese culture by telling background stories of the tour sites. Regarding to our drivers, they are all licensed and experienced with no traffic accident record. At the cruise port, you would be met in time, greeted by our fluently English- speaking guide and transferred safely to attraction by our driver. As your tour commences, the driver would drive you to every destination in your itinerary and the guide would accompany you during the whole sightseeing process. Both the guide and driver would be at your service throughout the tour. Finally, our guides and drivers have a great organizing and accommodating ability so they can handle various unexpected events during your tour and assure you of a wonderful tour experience in China. TianjinPortTours.com realized that you want to travel in the comfortable way. All of our vehicles are air-conditioned, clean, seated comfortable, uncrowded and safe. And all of our vehicles are tourism qualification certificate of operating vehicles. We are here to answer any questions you may have. Please feel free to call us at +86 10 65703114 (24/7). Or send an email to contact@beijingtoursguide.com, we will reply to you less than 12 hours. We will be arriving on Milennium next year. We are very interested in your 2 or 3 day tours. Do you have any tours that use the bullet train to/from Tianjin? We would very much like to experience this train. Thanks! Sorry, we do not do the tours with bullet train. Hello! My husband and I will arrive at Tianjin Port on the Westerdam on March 25 at 8am. We would like to go straight to one of the Great Wall sections and then be dropped at Beijing Tianamen square. Is there a tour that fits our needs? We would also be interested at a car to get back to the ship on the 26 in the afternoon. Please let me know if you have anything available and how much it would cost per person. Thanks! My wife and I are on March 30th 2019 Celebrity Millennium Sailing that arrives at Tianjin Port on April 3rd. We currently have reservation at Renaissance Beijing Wangfujing Hotel for 2 Nights (April 3rd & 4th). Can you pick us up and drop us off at hotel? How much will 3 Days Beijing GROUP Tour from Tianji (Xingang)port without Shop Stops cost us since we made our own hotel arrangements. On Day 1 we would meet tour guide & driver at 9am at port take tour and be dropped off at our hotel. On Day 2 we would want to be picked up from our hotel and dropped off at hotel at end of tour. On Day 3 we would like to be picked up from hotel, take tour and be dropped back at Tianjin Port before 4pm as described in your tour description. Yes, you can book the hotel on your own. We will drop off and pick-up from your hotel. My parents will also be on this ship mentioned here on the same exact dates! Can you please peovide me with same quotation? Sorry, we do not have 1 day group tour. We only have 2 days group tour suitable for you. You can see tour details at: 2 Days Beijing GROUP Tour from Tianjin (Xingang) Port without Shop Stops. We have some clients booked this tour from your same cruise. how Much is the cost for 2days peiking tour? The prices are listed on the page, please recheck. I want make a reservation 2days beizing tour with 4star hotel 2person. How to make a reservation? We just sent you an email about the tour details, please check and you will know how to book the tour. We arrive in Tianjin on the Celebrity Millennium on 24 March 2019 and are interested in your 2 day tour to the Great Wall and Beijing (no shopping)with an overnight stay at one of your 4-star hotels. There are two of us and we are interested in joining in with a smaller group, if possible. According to your request, we recommend you take our 2 Days Beijing GROUP Tour from Tianjin (Xingang) Port without Shop Stops. We have some clients booked this tour from your same cruise. We arrive in Tianjin on the Celebrity Millennium on 31 October and are interested in your 2 day tour to the Great Wall and Beijing. We will try to leave the ship as quickly as possible but what happens if the ship is delayed or we are held up while the cruise company disembark people for their own tours. No worries. Our tour guide and driver will wait for you. According to your cruise ship, we recommend you our 2 Days Beijing GROUP Tour from Tianjin (Xingang) Port without Shop Stops for you. We have some clients booked this tour from your same cruise. We will transfer you back to Tianjin port before 5pm on Feb. 23, 2019. On the website it shows the pickup point as a different port name, rather than the Tianjin Intternational Cruise Port for the arrival of the Westerdam on Feb. 22, 2019. Will pickup be at the Tianjin International Cruise Port? There is only one port in Tianjin for cruise ship. The Tianjin International Cruise Port is the Tianjin Xingang Port. No worries! We are coming to Tianjin on April 2, 2018 at 7 am on the Celebrity Millenium and the ship is leaving at 6 pm on April 4 and your 3 day 2 night tours were very intriguing to me. I couldn’t find your company listed on trip advisor, where might I find you there? Also of the three options, which would you recommend most for a couple in their 50s in good physical condition. This is our first time in Beijing. We recommend you our 3 Days Beijing GROUP Tour from Tianjin (Xingang) Port without Shop Stops. You can see details at: https://www.tianjinporttours.com/3-days-beijing-group-tour-from-tianjin-cruise-port/. The tour looks good I will get you my information soon and I will put a deposit on soon. My friend tony likes the trip so will pay 100% of mine to book his and my spot! we are talking about staying in shanghai after the cruise for 3 or 4 days. at this point we are unsure but I was looking at the shanghai xian tour or if you have some other good ones that are interesting and reasonable I would be interested in the price. I have tentatively booked the radisson Blu hotel because I hear it is close to the Bund and that is what I want to see but if you have a hotel that is as good as well located and at a better price ( including breakfast) I would be interested. there were no prices in your shanghai tours can you let me know? FYI we arrive in shanghai on the 3rd so we were thinking the 3- the 6th or 7th of March. the other thing I heard was that you could get a suit made over night . where would the best place be to do that? We are still hatching out logistical details – for example if we do the shanghai xian would we return to calgary from Xian or would it be better to do more in Shanghai? ( tony is coming to calgary for 3-4 days after the trip. are there better flights from xian or shanghai? what is less complicated. I am so in love with what I have read about China I know I will have to return. there is not nearly enough time to see even a small bit. I am interested in getting a piece of Jade ( just a little necklace) is it better in shanghai or should I look my one and only night in Beijing? I have asked a lot of questions if you cannot answer them do not worry. Thank you for your message. You can send an email to beijingtoursguide@gmail.com. We will use this email address to reply to you. Sorry, we do not do tours in Dalian. We have sent you an email about Beijing tour, have you got it? March 26. One adule one child. Norweigan Jewel. Do you know of others who may be looking to fill up a van for the great wall/Forbidden city tour? Thanks. Steph. Looking for a bit of help as it is just me my daughter. My wife and I are stopping in Tianjin on 2nd May while cruising on the Silver Shadow. We are looking for a day tour to Beijing with transport and guide. We saw the Forbuidden City some years ago so visiting there and Tianamin Square is not necessary. We are interested in the Olympic facilities and any other sights that you may consider of interest and possibly unusual. Shopping is not necessary. We are both in our early 60s. I am fit but my wife can’t walk excessively long distances. Are you able to help us with tour suggestions and prices. May I know your ship arrival & departure Tianjin port time? Then we will make a detailed tour itinerary for you. Silver Shadow arrives at7am and doesn’t leave unti the following day. We recommend you visit the Great Wall and Summer Palace. Do you offer direct non-stop service from Tianjin cruise port to Beijing Capitol Airport? We’ll be arriving in the early morning of Nov. 12 (around 6:00) on a Princess cruise ship and our flight departure is 12:30 from Beijing Capitol Airport. Yes, we can arrange a private car for you. Pick you up from Tianjin port at 6:30am, then transfer you to Beijing airport. The transfer fee is USD190 in total (based on 2 persons). How many people do you have? Just 2 people, my wife and I. Yes, I would like to have you arrange a private car for us. Please let me know how to arrange. For example, where do we meet and how do we pay you, in US$ or RMB equivalent, etc.? Our Princess Diamond ship arrives on Saturday, Nov. 12. I know it is still early with 2 months to go, but I just want to have everything arranged beforehand. Thank you so much for your quick respond and looking forward to be working with you. We just sent an email about your questions, please check it out. I am interested to find out more about your 3 day tour from port. I will be on Millennium in March 2017. Do you create the group? What size gropup would it be and does the pricing depend on the size of the group? Thakn you for contacting us. Yes, we have 3 days Beijing group tour from Millennium cruise on Mar. 20-22, 2017. And we have some clients have booked this tour already. You can see tour details at: http://www.tianjinporttours.com/3-days-beijing-group-tour-from-tianjin-cruise-port/. We just sent an email to you, please check it out. I’m looking for a 1-day tour from Tianjin cruise port to Beijing tourist attractions. We are 4 adults arriving on Celebrity Millennium. Would you please provide a quote how much will it cost for a group tour. Thank you for your message. Unfortunately, we only 2 days and 3 days group tours from Tianjin port suitable for Celebrity Millennium. And there are many people from your same cruise have booked these tours. I suggest you consider about it, because 2 days and 3 days group tours with very good prices. Please see details at: http://www.tianjinporttours.com/2-days-beijing-group-tour-from-tianjin-cruise-port/ and http://www.tianjinporttours.com/3-days-beijing-group-tour-from-tianjin-cruise-port/. I saw you specialize tours from Tianjin Port for Millennium passengers. We will arrive at Tianjin on 4/21/15 and want to have a two day Xian tour with one night hotel stay. Do you have a group tour for this? We can fly or take the bullet train whatever is feasible, but we must meet the Millennium arrival and departure schedule. Please provide a quote if you have such tour. If is a private tour, do you have other Millennium passengers interested in such tour? Thank you for your message. I recommend you visit this tour itinerary: http://www.tianjinporttours.com/3-day-beijing-tour-with-terracotta-warriors-from-tianjin-port-c/. I am looking for a 1 day group tour from Tianjin Port from the Celebrity Millennium cruise ship in April 2015. Do you have this tour available? I do not want a private tour, I am looking for a group tour only. How many people are on your group tours (3 day shore excursion Beijing)? Thank you for your message. There are about 18-22 people in a group with a 33-seat-coach. We just sent an email to you, please take a look. Where can I see the reviews for your company? Where can I find the reviews for your company?